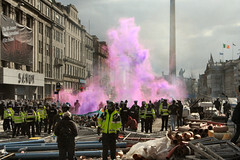 Waking up on Saturday morning – on Illinois time – to news of riots in Dublin was not something I expected. The first hint I got was from fluffy’s blog, with of course much more coverage elsewhere, as he indicated. Gavin has summarized some of the blog coverage – I also checked out what Indymedia had to say. My personal reaction is very similar to that of most political leaders: the Love Ulster parade was undoubtedly intended to be provocative (you’ve only got to look at the fact that some of the spokespeople were DUP leaders, and wonder why a Unionist/Loyalist parade should take place in Dublin; the Orange Order’s history of using parades for provocation should persuade the wavering) but the violent reaction is both to be condemned as unjustified, and decried as counter-productive. Some (not most) Indymedia posts were by people who took part in the riot, trying to portray it as a reaction to heavy-handed policing. So a peaceful protest turned into people throwing fireworks and petrol bombs (spot the pre-planning? ), breaking windows of multiple businesses, stealing alcohol from off-licenses, and throwing chairs through the windows of the offices of political parties, because some Gardaí pushed forward a little forcefully? Somehow, I think not. Mailing lists I’m on have received mails indicating that warnings were being circulated well in advance that significant trouble was being planned for yesterday (which of course casts some doubt on the state of the Garda Siochána’s intelligence). This riot was not a successful anti-corporate, anti-fascist or anti-imperial action. It was the work of thugs and provocateurs who get off on violence and disorder. The forces of hatred and sectarianism – on both sides – are the only members of our society who are happy today.